2017 Tokyo Marathon top elites Wilson Kipsang, Dickson Chumba, Tsegaye Kebede, Amane Bersio, Amane Gobena, Birhane Dibaba, Masato Imai, Kazuhiro Maeda and Yuma Hattori. The Tokyo Marathon celebrates its eleventh edition as a mass-participation race this year on a new course with relocated hills to make it faster for the front end and a scenic finish for the masses. To try to bring its event records more into line with the rest of the Abbott World Marathon Majors Tokyo has brought in some big guns, none bigger than former world record holder Wilson Kipsang (Kenya). 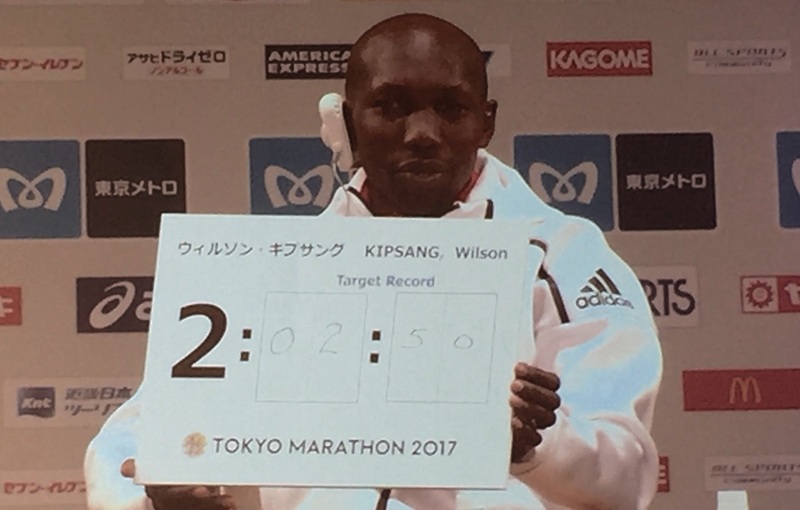 Fresh from a 2:03:13 PB at September's Berlin Marathon, Kipsang brought Friday's press conference to a boil when he predicted in writing a 2:02:50 world record on the new Tokyo course. Kipsang predicting a 2:02:50 world record. That may be a stretch, but looking at the depth and quality of the competition the 2:05:42 Tokyo record held by Dickson Chumba (Kenya) looks vulnerable, with the 2:05:18 Japanese all-comers record set by Tsegaye Kebede (Ethiopia) in range if all goes well and the weather cooperates. 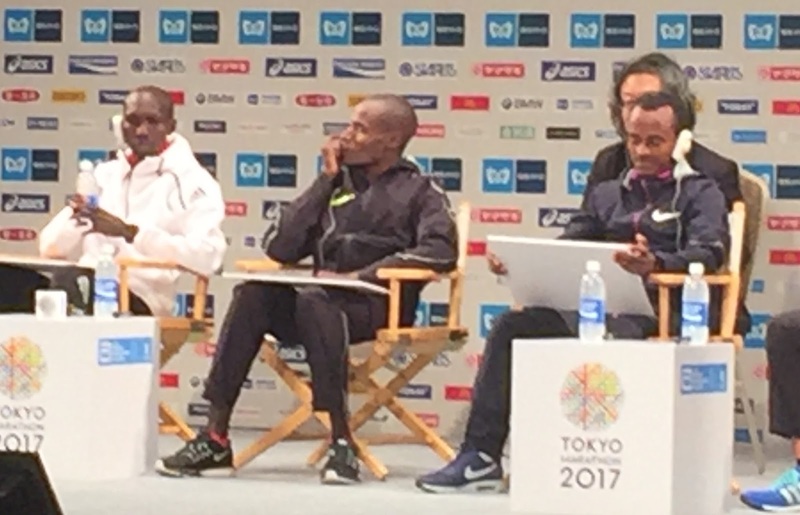 It was a rare and mostly unrecognized moment in Japanese marathoning history at the press conference when Kipsang, the course record holder at the Lake Biwa Mainichi Marathon, shared the stage with Tokyo course record holder Chumba and Fukuoka course record holder Kebede, the three kings of Japan's three greatest men's marathons all united. Kebede boldly predicted a 2:03:50 PB, with Chumba more circumspect in estimating a 2:05:20 to better his own record. The front group, which includes seven other men with recent sub-2:07 times, is scheduled to go out at 2:55/km, 2:03:04 pace. If Kipsang is serious he may not have much company for long. If it turns into a 2:05 race, look for Evans Chebet (Kenya) to surprise off his 2:05:33 and 2:05:31 pair of 2016 marathons. When we were kings - Kipsang, Chumba and Kebede, CR holders of Japan's three major men's marathons. For the Japanese men Tokyo is mostly about qualifying for the London World Championships team, a murky selection process of four races to chose three places made more complicated by Kentaro Nakamoto (Team Yasukawa Denki) running 2:09:32 to win the Beppu-Oita Mainichi Marathon earlier this month, slower than the 2:09:11 by Yuki Kawauchi (Saitama Pref. Gov't) in Fukuoka in December but bettering his placing by two. The JAAF will auto-select one Japanese man in Tokyo if he breaks 2:07:00, a time only three have ever cleared. Next week the Lake Biwa Mainichi Marathon will bring qualifying to a close, the men there having the luxury of keying off Kawauchi, Nakamoto and whoever runs fastest in Tokyo. Yuma Hattori all business with a 2:08:00 prediction for his second marathon. 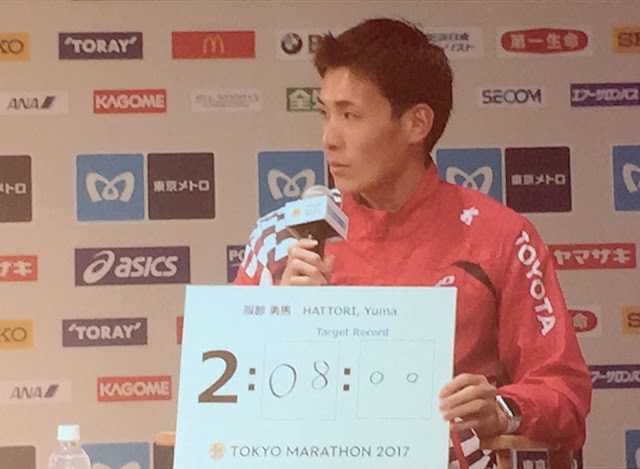 1:28:52 collegiate 30 km national record holder Yuma Hattori (Team Toyota) was the most outwardly ambitious of the Japanese men at the press conference, estimating a 2:08:00, but he has competition from Masato Imai (Team Toyota Kyushu), Arata Fujiwara (Miki House), the debuting pair Takashi Ichida (Team Asahi Kasei) and Yuta Shitara (Team Honda), and many more. When it comes to the 2:09~2:11 range there are always surprises in Japanese men's marathoning with relatively unknown athletes dropping breakthroughs. Yuki Takamiya (Team Yakult), then an unknown 2:15-level runner, did it last year with a 2:10:57 for top Japanese honors and will be back again to try to follow up. Along with Ichida and Shitara, American Andrew Bumbalough will be debuting after a decent run at November's Hachioji Long Distance meet. Ethiopian power trio Beriso, Gobena and Dibaba. 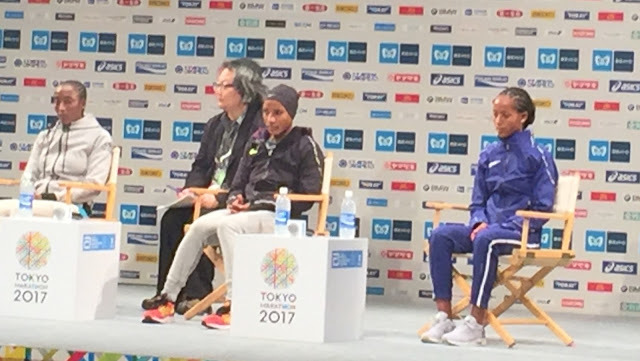 The women's field took a hit with the withdrawal of #1-ranked Lucy Kabuu (Kenya) and another with a flight delay that had the debuting Betsy Saina (Kenya) arriving in Japan less than 48 hours before the start, leaving a likely three-way Ethiopian race up front. Amane Beriso has the fastest women's time in the field with a 2:20:48 Dubai debut last year, but with only a 2:39:38 follow-up in Boston there's a large question mark hanging over her. Amane Gobena was 2nd last year in a PB 2:21:51 and has a truckload of experience racing in Japan including a win in Osaka and a runner-up placing in Saitama. Birhane Dibaba set her 2:22:30 PB in Tokyo in 2014, won it in 2015 and was 5th last year. Barring a spectacular debut from Saina it's hard to see anyone else challenging them, especially with the Amanes both predicting 2:20:00 finish times at the press conference. If they come even close to that they will take down both the 2:21:27 Tokyo record set last year by Helah Kiprop (Kenya) and the 2:21:18 Japanese all-comers record held by Athens Olympics gold medalist Mizuki Noguchi (Japan). American Sara Hall will also be running, hoping to break 2:30 for the first time. Because Tokyo doesn't factor into national team selection for women there are essentially no top-level Japanese women in the field, the fastest being Kaori Yoshida (Team RxL) with a 2:28:43 best. Along with Kaoru Nagao (Urayasu T&F Assoc. ), Hiroko Yoshitomi (Team Memolead) and the debuting Kotomi Takayama (Team Sysmex) Yoshida may give Hall some company, but if any Japanese woman succeeds in breaking 2:30 on the course it will be a big day. Nippon TV's live broadcast of the Tokyo Marathon will be shown worldwide, with JRN's Brett Larner hosting for the second year in a row. Check your local listing for availability. The Japanese-language broadcast is also viewable in many locations via mov3.co. Athlete tracking options are listed here, with the lead men's live leaderboard here. Check JRN post-race for complete results and more exclusive coverage. Except Tsegaye Kebede has a 2:04:32 PB set in Chicago in 2012. As it says, the times listed are the athletes' best within the last three years, not their PBs.